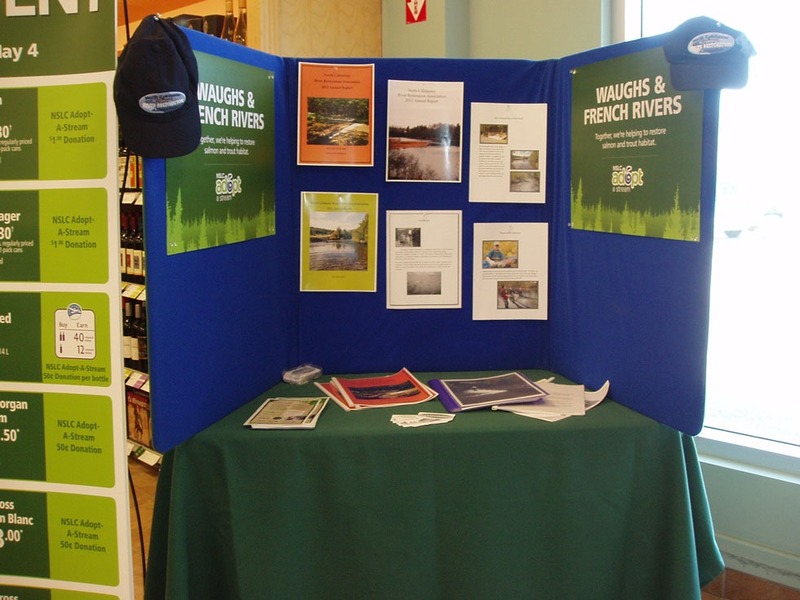 It was a busy day at the Tatamagouche NSLC on Saturday the 26th of April. 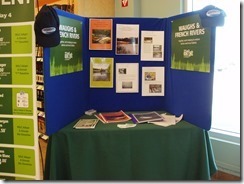 Five of our Board members met with the public and informed them of our Partnership with Adopt a Stream. The occasion was our Annual Exhibit at the NSLC. This annual event affords our Committee members an opportunity to say Thank You to our community for purchasing product at our local NSLC. 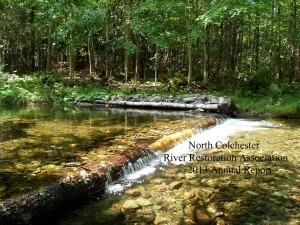 It also allows us to inform the general public how a percentage of their purchase makes it back to our community to finance our important restoration program. 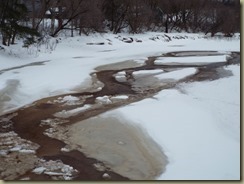 Thanks to NSLC and Adopt a Stream we are able to make a positive difference on the North Shore. When will it end? 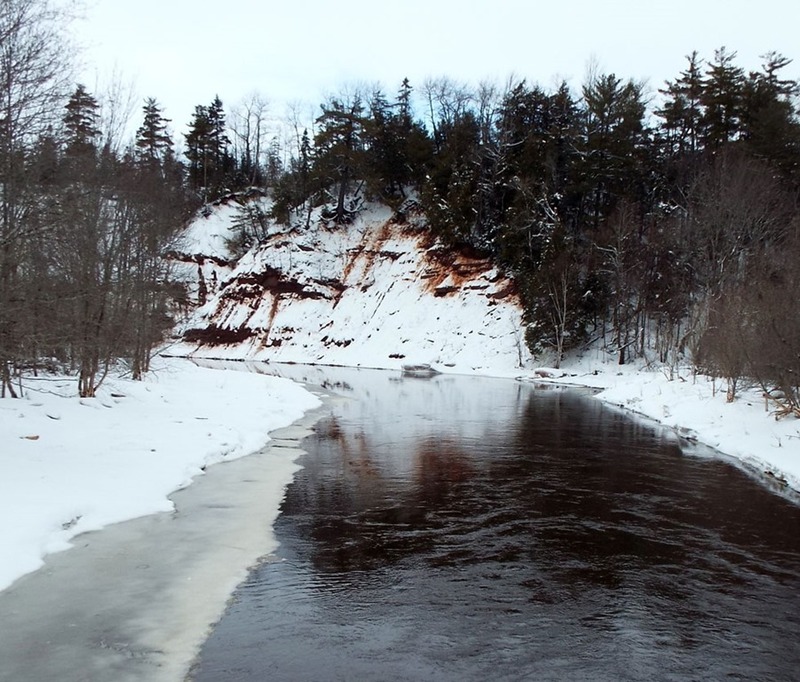 Instead of fishing upstream of The Falls yesterday I spent most of the day moving snow. 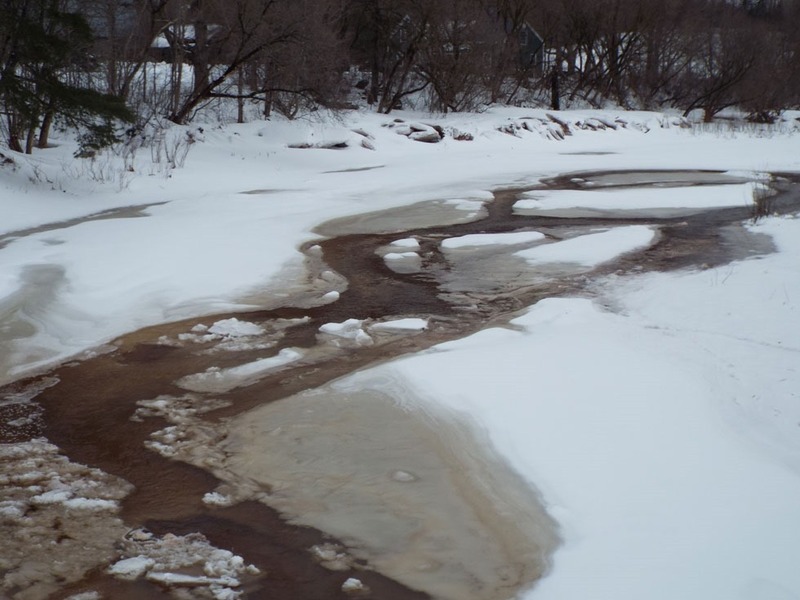 Water levels are excellent and most likely the number of Brown trout in both of our rivers is very high. Tight lines when you get by the ice safely. This year’s Eggs have arrived. 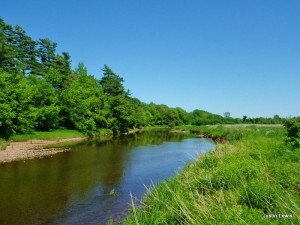 The Atlantic Salmon Federation, in cooperation with the Nova Scotia Salmon Association and The North Colchester River Restoration Association, delivers its Fish Friends Educational Programs to students in Nova Scotia including Tatamagouche Elementary School. Students learn about the life of salmon, trout and other aquatic creatures in marine and freshwater ecosystems. These activities teach youngsters important conservation and environmental lessons in a hands-on classroom setting. 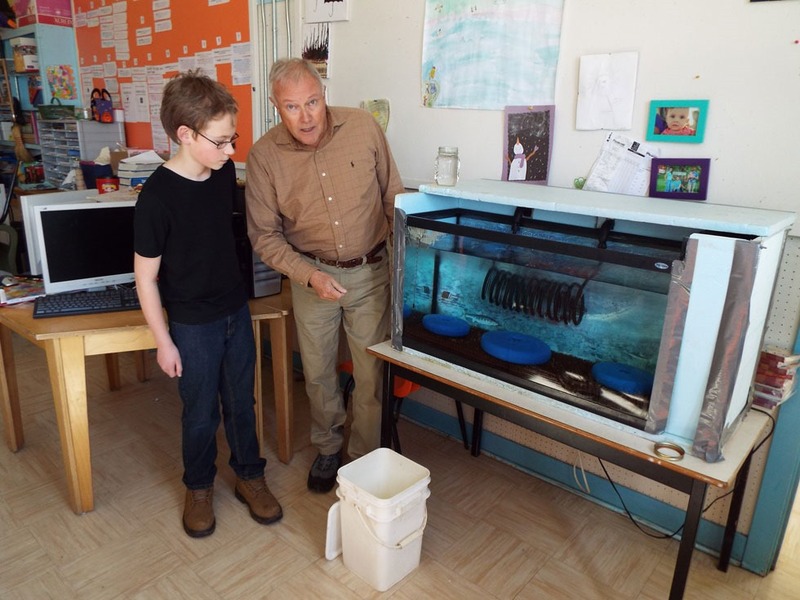 In the Photo below Doug Bastow a NCRRA Committee member and Matthew Ross a student at Tatamagouche Elementary School have just placed this year’s eggs in the aquarium. 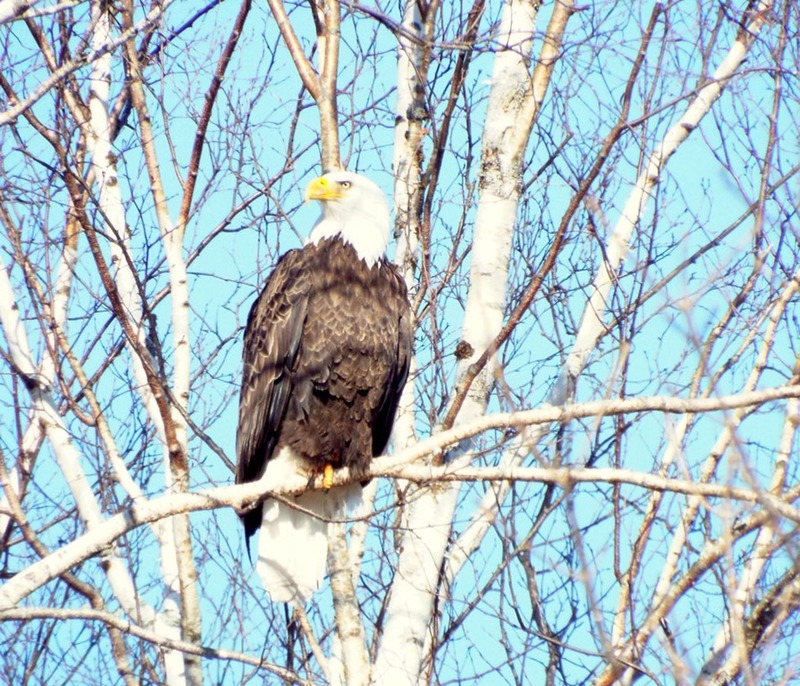 Security Personnel at the Provincial Hatchery are always On Guard. 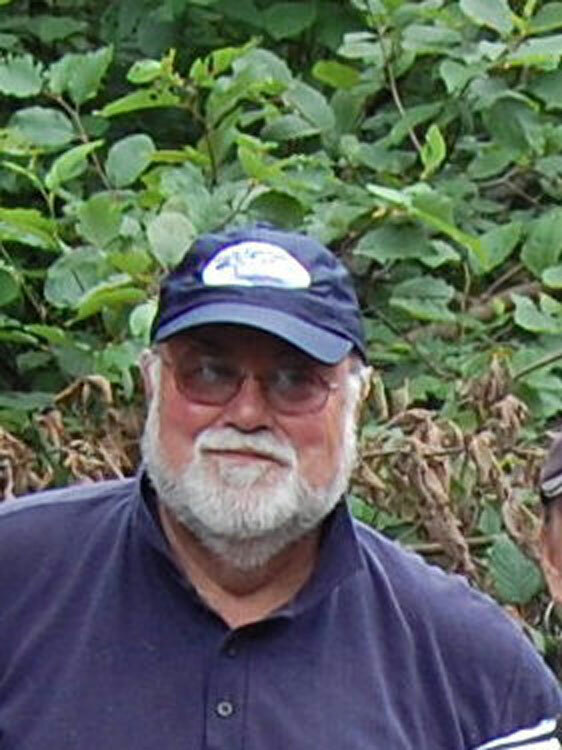 Perry Swan, Doug Bastow are in the photo below. 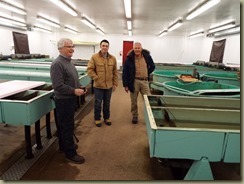 With them is Steve Thibideau the manager of the Provincial Hatchery at Fraser’s Mills. 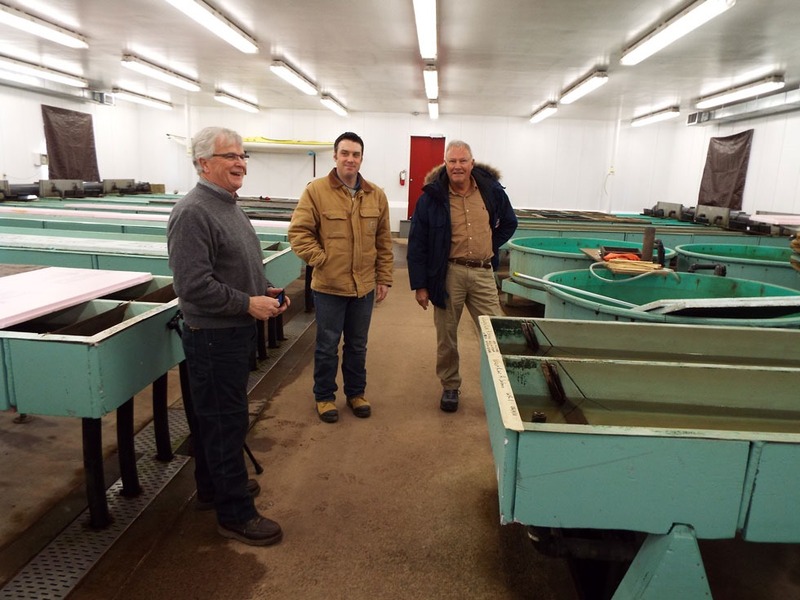 Last week we paid Steve a visit to tour the Hatchery and also to pick up the Trout eggs to be hatch out at The Tatamagouche Elementary School. 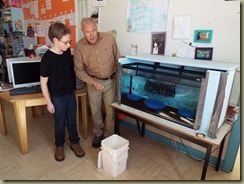 Our Fish Friends Program has been going for several years now and allows the students to manage the small aquarium and the eggs to hatch out. 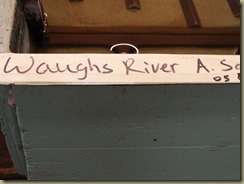 The kids then release the tiny trout in the Waugh’s River. The picture below clearly identifies that this tray of approximately 40,000 salmon eggs is part of our Waugh’s River Broodstock Program . 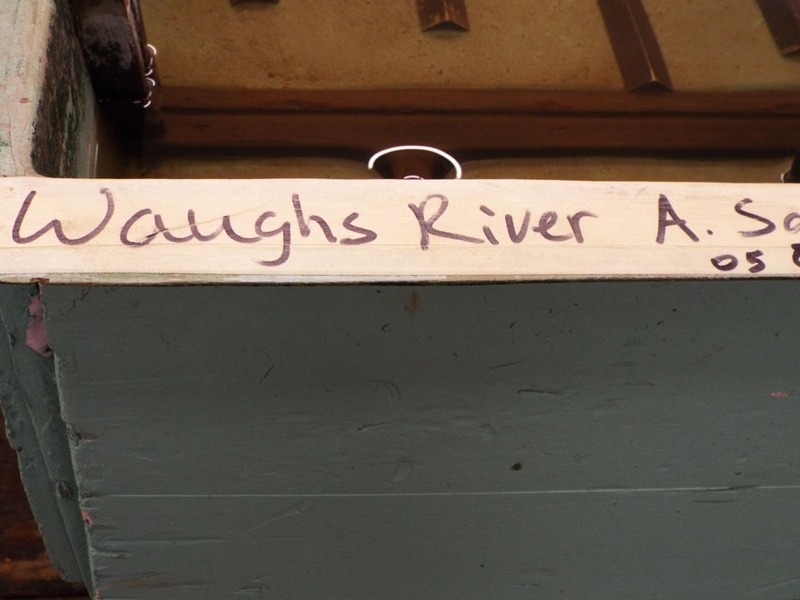 The Province is a vital Partner with our Association to ensure that salmon numbers returning to our rivers will continue to rise. 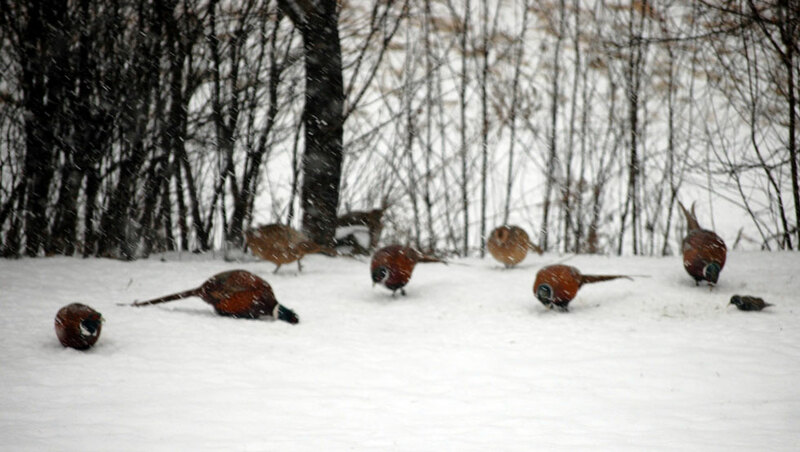 We are less than a few weeks before the 2014 Fishing season commences. As you can see by today’s pictures at Murdoch’s Bridge on the Waugh’s River we can see water flowing but believe me it is -13 this bright sunny day. 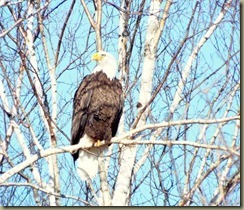 Clean up your gear, get your fishing license NOW and get ready TO RELAX, it’s not long now. 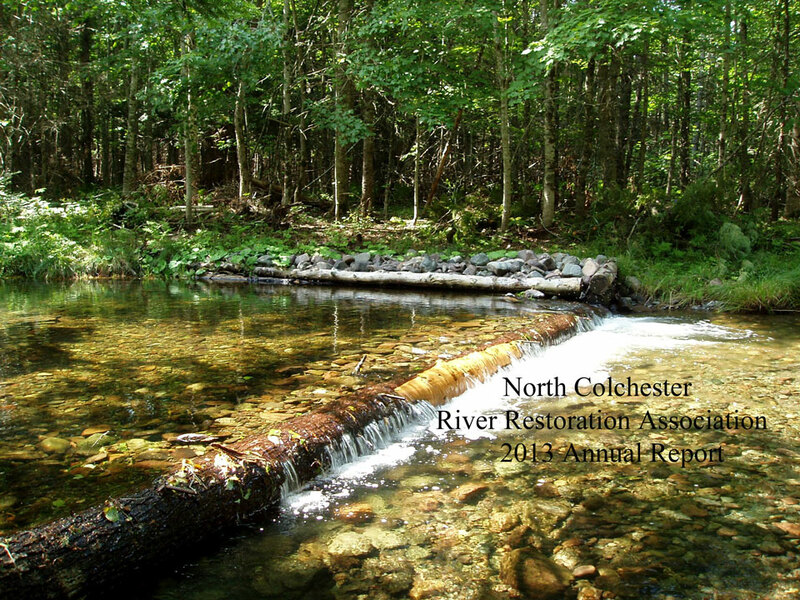 The Annual Meeting for the North Colchester River Restoration Association was held last night in Tatamagouche. The Committee approved the recommendations of the out going Chairman, Perry Swan, that long time committee member Edward Sampson would take the Chair position for the next 2 years. Over the next few months Edward will present this year’s Work Plan to the Committee for approval. All information will be made public on this Website. 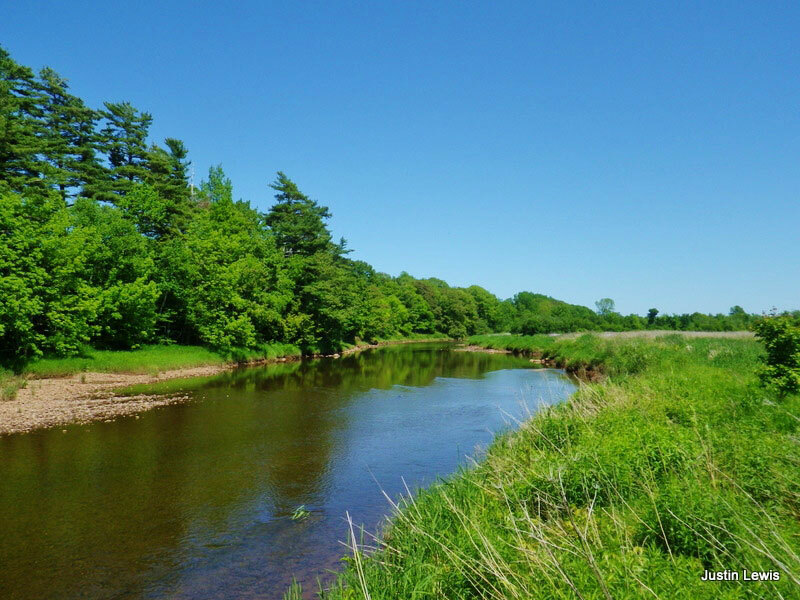 Following our Presentation to Colchester County Municipal Council in Truro last month the Council has agreed to continue funding our important work for five more years. 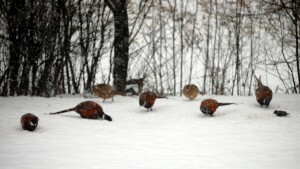 Check out the article in today’s Truro Daily News. Good Morning and Happy New Year. 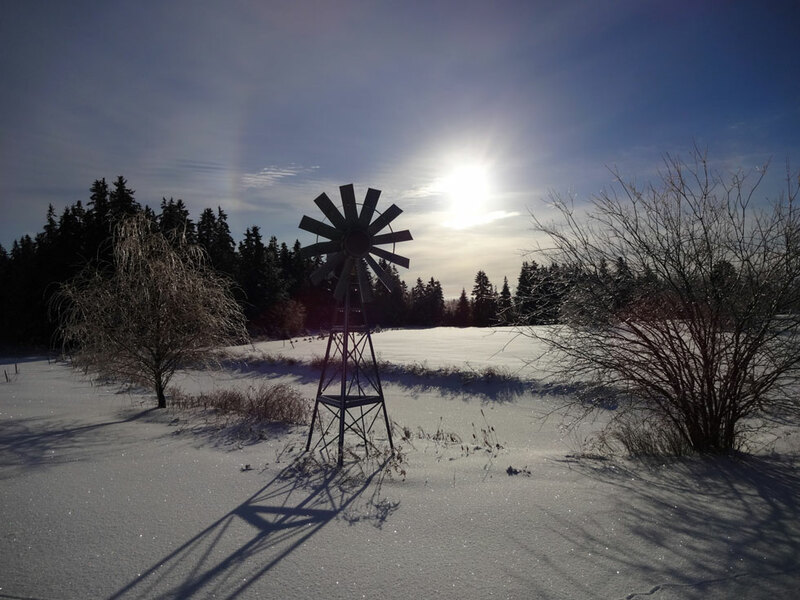 This morning’s temperature is more than cool and the view from Brule to PEI is frozen white. 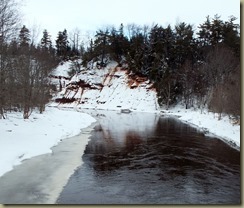 Open water on the French and The Waugh’s rivers is hard to find but then it is winter on the North Shore. 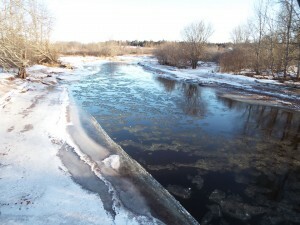 As you can see in the photo of my trout pond yesterday, 8 inches thick in ice and not a trout in sight. Our Annual Report will be released in three weeks, read it online or request a copy via this Webpage. Keep warm and release all of your salmon this year.